Blue Mountain College student, Cyprian Ngetich, shares his experiences with NAHS students. 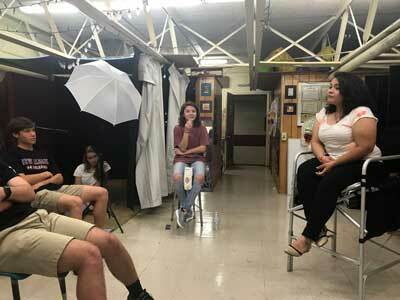 Veronica Mejia, a 2008 graduate of New Albany High School, visited the journalism class at NAHS on May 16. Veronica is in her last year at the University of Mississippi where she is a broadcast journalism major. She spoke with the journalism students about how she became interested in journalism and the classes she has taken. She gave them advice on how to pursue a degree in journalism and the skills they could improve on to make them better in this field. 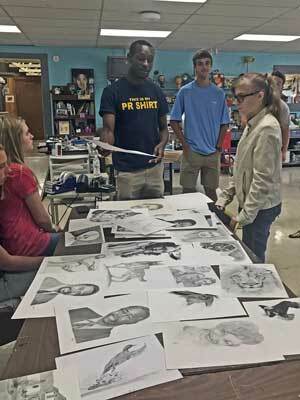 Cyprian Ngetich, a student at Blue Mountain College, visited the art classes at New Albany High School on Monday, May 14. Cyprian is a self-taught artist who moved to the United States from Kenya in 2014. He came here to study aerospace engineering, but due to the encouragement of others is currently pursuing his gift and passion as an artist. He is a runner on the Blue Mountain College Cross Country team and resides with NAHS Chemistry teacher, Phillip Laney and family. Students were amazed at the gifts of Cyprian as well as his dedication to improving his craft and his work ethic towards everything he does.